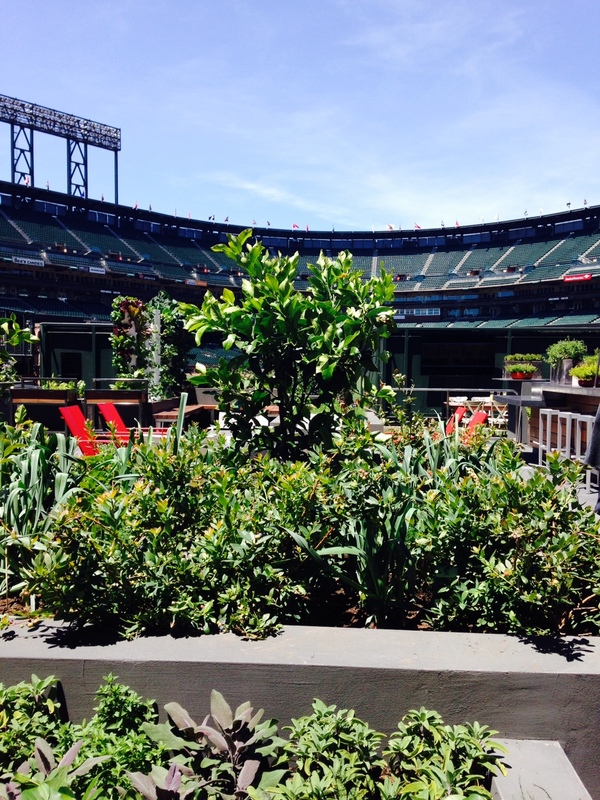 San Francisco Giants president and CEO Larry Baer and the team’s right-fielder Hunter Pence today helped cut the vine to a new edible garden behind center field at AT&T Park. The Garden opened today as a partnership with Bon Appetit Management Company, the park’s food service company, to supply a variety of lettuces, vegetables, herbs, fruits and even hops for the company to use in menus throughout the stadium and in the newly constructed area that used to be a plot of grass and concrete barriers. The 4,320 square-foot space at the border of center field underneath the scoreboard includes two new food stands offering salads, smoothies, sandwiches and other dishes using ingredients from the nearby garden, will also be used as a gathering place during games and as a “nutritional classroom” for children. He commented on the garden, calling it “beautiful,” before joining Baer and others from Bon Appetit to cut a thick vine at the entrance of the Garden. The Garden will also serve as a space for community groups, including many that work with children, such as the dozen or so children brought to the Garden today from the Junior Giants organization and the Willie Mays Boys & Girls Club at Hunters Point. The group of kids entering third through sixth grades enjoyed a sunny picnic lunch with Pence, who ate salad and a colorful variety of fruits with the children. Before eating, the youngsters made their own mini-gardens by planting seeds in coffee cups filled with dirt. 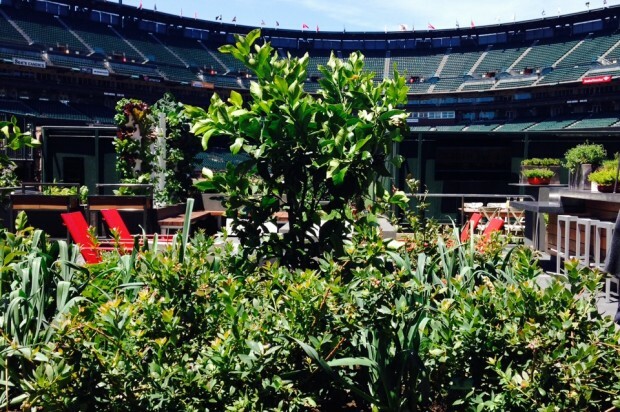 The Giants’ partnership with Peet’s Coffee & Tea will also come into play at the Garden, with used coffee grounds being used as fertilizer on the garden beds. Peet’s coffee products will also be available for sale at the Garden. Baer said the idea for the garden took about two years to come to fruition. President Barack Obama was the first to announce the AT&T Park ballpark garden in 2013 when he met with the 2012 World Series-winning Giants team at the White House. Some of the many things growing in the garden include kumquats, lavender, blueberries, strawberries, leeks, watercress, tomatoes, lemon grass, artichokes and other herbs, lettuces, flowers, fruits and vegetables.